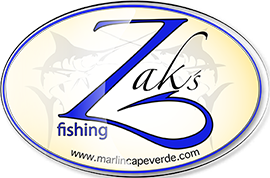 You will be fishing with the fabulous Mystic Blue, a 2005 model 36’ Express Jersey Cape and a proven fish-raiser. It is powered by twin 450 CV Caterpillar engines and is fully equipped with the best equipment including Furuno navigation system, Release Marine fighting chair, tuna tubes, and all the necessary fishing materials of the highest-quality to catch the big blue of your dreams. Mystic Blue has a 100 sq. ft. cockpit and over 200 gallons of fish box space. A spacious center-line raised helm allows an un-obstructed view. Step below deck to find creature comforts to rival sportfish twice her size. The fishing tower with a second helm atop is a major advantage in searching for fish and great for watching the action. The boat is a Blue Marlin Magnet, the boat was located in Dakar before coming to Cape Verde, and it raised a lot of blues, including some nice ones. There is a very nice main helm, with all the layout arround, and a fantastic view to look arround waiting for the bites, with the Captain, it has a tuna tower, from where the view is fantastic to search the birds, the activity, and the blues surfing onto the surface. The cabine is equiped with all the confort you would need. This is crystal clear as soon as you step aboard. In addition to providing excellent visibility. Clean, functional and extremely well-equipped, the cockpit and helm decks are just the beginning of this classic boat’s appeal.